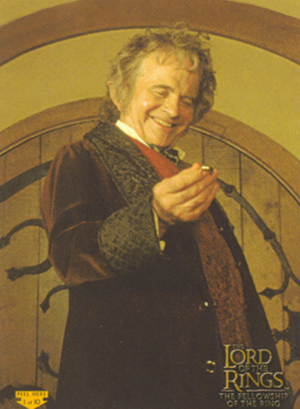 2001 Topps Lord of the Rins: The Fellowship of the Ring kicked off one of the most successful runs of movie-based trading cards. The first of three films, the franchise spawned nearly a dozen sets from Topps alone between 2001 and 2008. This was the set that started the momentum. Bolstered by a strong autograph checklist, the set remains one of the top entertainment trading card sets of the new millennium. The 2001 Topps Lord of the Rings: The Fellowship of the Ring has a 90-card base set. After a title card, which uses the art from one of the iconic posters, 17 character cards follow, profiling the ensemble cast. Cards 19 through 81 are story cards that cover the basic plot. The set closes out with eight behind-the-scenes cards and a checklist. Base cards have a clean design with large, glossy stills from the film. The name plate is prominent but blends in nicely. Foil highlights help ensure the modern look and feel. 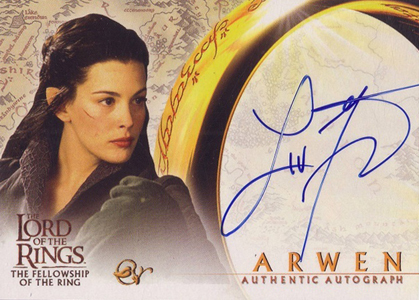 Where 2001 Topps Lord of the Rings: The Fellowship of the Ring really stands out is with its autographs. Hobby boxes have at least one (although, they're know to have more). Released before sticker signatures became the norm in Topps entertainment products, all are hard-signed. The horizontal design has a character image on one side and a large white signing area framed by the famous ring. Nearly the entire main cast signed for the set, including Elijah Wood, Viggo Mortensen, Sean Astin, Cate Blanchett and Liv Tyler. Orlando Bloom, Christopher Lee and Hugo Weaving are among the retail autographs. Sean Bean can only be found in packs distributed in the UK. 2001 Topps Lord of the Rings: The Fellowship of the Ring has a pair of basic inserts. Prismatic Foil cards are fairly easy to come by, inserted 1:10 packs. Found only in retail packs, Stickers fit together to form a puzzle. Lord of The Rings LOTR FOTR Printer Proof Error “Autograph“ Cards INSANELY RARE! 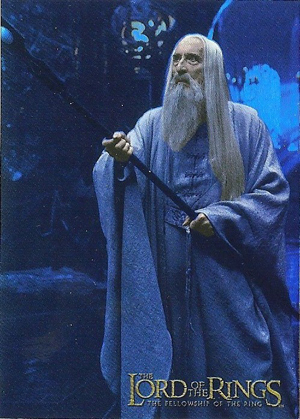 Lord Of The Rings LOTR FOTR Ian Mckellen Gandalf Beautiful Autograph Card!! 67 Fool of a Took! Autographs combine to fall one per hobby box. Those exclusive to retail and UK packs noted below. 2 foil cards. Inserted one per hobby box. 10 cards. Exclusive to retail packs. I have a autograph card of gimli from the fellowship of the ring. I can’t find a price guide for it. Could you tell me what it is worth. don semo � Your best bet is to check completed sales on eBay. The last two sold for $135 and $155. I have a Dominic Monaghan authentic autograph Topps 2001. I’m willing to sell this card, do you know how much this card is worth? I know it is rare. 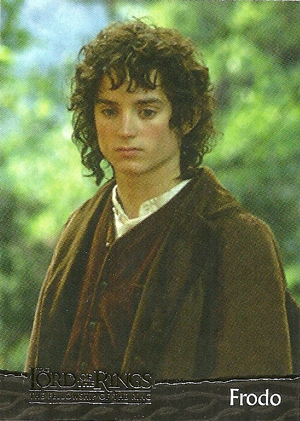 I have a full set 1-90 plus all foil cards, 2 bonus Frodo foil cards and 2 pre-release promo cards in the original folder, do you know how much this would be worth?